The Mariners were created as a result of a lawsuit. In 1970, in the aftermath of the Seattle Pilots' purchase and relocation to Milwaukee as the Milwaukee Brewers by Bud Selig, the city of Seattle, King County, and the state of Washington (represented by then-state Attorney General and future U.S. Senator Slade Gorton) sued the American League for breach of contract. Confident that Major League Baseball would return to Seattle within a few years, King County built the multi-purpose Kingdome, which would become home to the National Football League's expansion Seattle Seahawks in 1976. The name "Mariners" was chosen by club officials in August 1976 from over 600 names submitted by 15,000 entrants in a name-the-team contest. 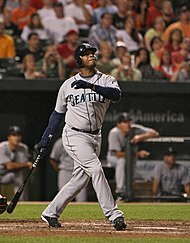 Ken Griffey Jr. holds six single-season batting records and an individual career record for the Mariners franchise. The Mariners played their first game on April 6, 1977, to a sold-out crowd of 57,762 at the Kingdome, losing 7–0 to the California Angels. The first home run in team history was hit on April 10, 1977, by designated hitter Juan Bernhardt. That year, star pitcher Diego Seguí, in his last major league season, became the only player to play for both the Pilots and the Mariners. The Mariners finished with a 64–98 record, echoing the record the 1969 Pilots once held; however, the team was able to avoid last place in the AL West by half a game. In 1979, Seattle hosted the 50th Major League Baseball All-Star Game. After the 1981 season, the Mariners were sold to California businessman George Argyros, who in turn sold the team to Jeff Smulyan in 1989, and then to Nintendo of America in 1992. During the 1992–93 offseason, the Mariners hired manager Lou Piniella, who had led the Cincinnati Reds to victory in the 1990 World Series. Mariner fans embraced Piniella, and he would helm the team from 1993 through 2002, winning two American League Manager of the Year Awards along the way. The 2001 Mariners club finished with a record of 116-46, leading all of Major League Baseball in winning percentage for the duration of the season and easily winning the American League West division championship. In doing so, the team broke the 1998 Yankees American League single-season record of 114 wins and matched the all-time MLB single-season record for wins set by the 1906 Chicago Cubs. At the end of the season, Ichiro Suzuki won the AL MVP, AL Rookie of the Year, and one of three outfield Gold Glove Awards, becoming the first player since the 1975 Boston Red Sox's Fred Lynn to win all three in the same season. On October 22, 2008 the Mariners announced the hiring of Jack Zduriencik, formerly scouting director of the Milwaukee Brewers, as their general manager. Weeks later, on November 18, the team named Oakland Athletics bench coach Don Wakamatsu as its new field manager. Wakamatsu and Zduriencik hired an entirely new coaching staff for 2009, which included former World Series MVP John Wetteland as bullpen coach. The off-season also saw a litany of roster moves, headlined by a 12-player, 3-team trade that included sending All-Star closer J. J. Putz to the New York Mets and brought 5 players—including prospect Mike Carp and outfielder Endy Chávez from New York and outfielder Franklin Gutiérrez from the Cleveland Indians—to Seattle. Many of the moves, like the free agent signing of Mike Sweeney, were made in part with the hope of squelching the clubhouse infighting that plagued the Mariners in 2008. It also saw the return of Seattle favorite Griffey Jr. The 2009–10 offseason was highlighted by the trade for 2008 American League Cy Young Award winner Cliff Lee from the Philadelphia Phillies, the signing of third baseman Chone Figgins and the contract extension of star pitcher "King" Félix Hernández. Griffey Jr. announced his retirement on June 2, 2010, after 22 MLB seasons. Félix Hernández has made five All-Star appearances as a member of the Seattle Mariners. The Mariners fired field manager Don Wakamatsu along with bench coach Ty Van Burkleo, pitching coach Rick Adair and performance coach Steve Hecht on August 9, 2010. Daren Brown, the manager of the AAA affiliate Tacoma Rainiers, took over as interim field manager. Roger Hansen, the former Minor League catching coordinator, was promoted to bench coach. Carl Willis, the former Minor League pitching coordinator, was promoted to pitching coach. The Mariners hired former Cleveland Indians manager Eric Wedge as their new manager on October 19, 2010. Dave Niehaus, the Mariners' play-by-play announcer since the team's inception, died of a heart attack on November 10, 2010, at the age of 75. In memory of Niehaus, Seattle rapper Macklemore wrote a tribute song called "My Oh My" in December 2010. He performed the song at the Mariners' Opening Day game on April 8, 2011. On April 21, 2012, Philip Humber of the Chicago White Sox threw the third perfect game in Chicago White Sox history against the Mariners at Safeco Field in Seattle. It was the 21st perfect game in MLB history. Mariners starting pitcher Kevin Millwood and five other pitchers combined to throw the tenth combined no-hitter in MLB history and the first in team history on June 8, 2012. The last combined one occurred in 2003, when six Houston Astros no-hit the New York Yankees in New York. The six pitchers used in a no-hitter is a major league record. Félix Hernández pitched the first perfect game in team history, shutting down the Tampa Bay Rays 1-0 at Safeco Field on August 15, 2012. It was the 23rd perfect game in Major League Baseball history. The Mariners became the first team in Major League Baseball to be involved in a perfect game two times in one season. General Manager (GM) Jack Zduriencik was relieved of his position by the team on August 28, 2015. Jerry Dipoto, who formerly served as GM of the Los Angeles Angels of Anaheim, was hired as the new GM of the Mariners one month later. On October 9, 2015, manager Lloyd McClendon was fired, and the search for a new manager was begun. Scott Servais was named the new Mariners' manager on October 23, 2015. Nintendo of America issued a press release on April 27, 2016, stating it would sell most shares it held of Seattle Mariners ownership to First Avenue Entertainment limited partnership. Nintendo retained a 10% ownership share of the team after the sale was completed in August 2016. 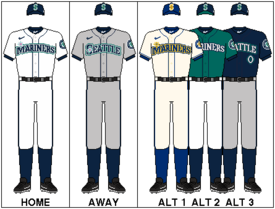 The Mariners donned their current uniforms in 1993 (with a slight change to the color arrangement of the wordmarks made in 2015). White jerseys and pants are worn for most home games, while gray jerseys and pants are worn on the road. In 2011, the team brought back an alternate "Northwest Green" jersey that was previously part of the uniform set from 1994 to 1996 to be worn during Friday home games. A navy blue alternate jersey is worn for occasional road games; other variations of a navy jersey had been used as home alternates prior to the reintroduction of the Northwest Green jersey. A navy blue cap that features a ball and compass "S" logo is paired with the home white, road gray, and navy blue jerseys. A variation of this cap with a Northwest Green brim is worn with the home alternate jersey. In January 2015 the team announced a new alternate uniform to be worn for Sunday home games. This cream-colored "fauxback" uniform features the current logo and lettering style in a royal blue and gold color scheme, a throwback to the original team colors. Unlike the rest of the uniform set, the back of the jersey does not display the player name. The cap features the current cap logo in the throwback colors. The Peoria Sports Complex in Peoria, Arizona, has been the Mariners' home spring training facility since 1994. The complex is shared with the San Diego Padres. On March 25, 2013, in a 16-0 victory over the Cincinnati Reds, the Mariners broke the team record for total home runs during a spring training season with 52. This is a partial list listing the past 21 completed regular seasons. For the full season records, see here. Lost ALCS vs New York Yankees, 4–1. Tied the regular-season record with 116 wins, but went 4–6 in the postseason. 2004 63–99 .389 4th Ichiro had 262 hits, which broke the 84-year-old hit record. Edgar Martínez retired after his 18th and final season with the Mariners. First team of 2008 to officially be eliminated from the 2008 postseason. Worst record since 1983, which was the last time they had lost over 100 games in a season. First team in MLB history to lose 100 games with a $100 million payroll. Dave Niehaus won the Ford C. Frick Award, presented by the National Baseball Hall of Fame and Museum. 2009 85–77 .520 3rd Ichiro set the new record for most consecutive 200-hit seasons at 9. 2010 61–101 .377 4th Félix Hernández won the 2010 AL Cy Young Award. Ichiro and Franklin Gutiérrez won the 2010 Rawlings Gold Glove awards for AL Right Field and Center Field, respectively. Former Executive Pat Gillick was elected to the National Baseball Hall of Fame by the Veterans Committee. Ichiro had his tenth consecutive season batting over .300 with 200 hits, winning a Rawlings Gold Glove Award, and appearing in the Major League Baseball All-Star Game. 2011 67–95 .414 4th Pitchers Félix Hernández, Brandon League, and Michael Pineda were named all-stars. 2012 75–87 .463 4th Celebrated 35th Anniversary of the franchise. Featured a combined no-hitter and perfect game by Félix Hernández. Became the first team in MLB history to both win and lose in perfect games in one season. Ichiro was traded to the Yankees on July 23. 2013 71–91 .438 4th Despite the Major League debuts of top prospects Nick Franklin, Mike Zunino, Brad Miller, Taijuan Walker and James Paxton, the Mariners once again failed to make the postseason. Although the Mariners took a major step forward in the power department, hitting the second most home runs in the American League (188 trailing Baltimore's 212), hitting fundamentals, questionable defense and a shallow pitching rotation and bullpen held the team back. On September 27, manager Eric Wedge announced that he would not return for the 2014 season. He was replaced by Lloyd McClendon. 2014 87–75 .537 3rd The Mariners made a surprising playoff run in 2014, but in the end, they fell short on the final day of the season. Félix Hernández won the AL ERA title with a 2.14 ERA and Robinson Canó had a career year in his first season with Seattle. 2015 76–86 .469 4th McClendon was fired after the season ended. On October 23, 2015 Scott Servais was hired as the team's new manager. 2016 86–76 .531 2nd The Mariners made another surprising playoff run in 2016, but they ultimately fell short of the playoffs once again. The trio of Robinson Canó, Nelson Cruz, and Kyle Seager all had stellar seasons themselves, but it was not enough to make the playoffs. T-Mobile Park (known as Safeco Field from 1999 to 2018) has been home to the Seattle Mariners since the first game vs. the San Diego Padres on July 15, 1999. There were 44,607 people in attendance that night. Seattle Mariners former chairman and CEO John Ellis announced on June 14, 1997 the creation of a Mariners Hall of Fame. It is operated by the Seattle Mariners organization. It honors the players, staff and other individuals that greatly contributed to the history and success of the Mariners franchise. It is located at the Baseball Museum of the Pacific Northwest in T-Mobile Park. b) come close to such election and have spent substantially his entire career with the Mariners. Eligibility shall not commence until after the former player has been voted on once for the National Baseball Hall of Fame, which for all practical purposes means six years after retirement. Ken Griffey Jr.'s number 24 was retired at the beginning of the 2016 season, with the retirement ceremony taking place on August 6, 2016. Griffey had been elected to the Hall of Fame in January of that year. Edgar Martínez's number 11 was retired during the 2017 season, with the retirement ceremony taking place on August 12, 2017. Martínez played his entire major-league career in Seattle and first appeared on the Hall of Fame ballot in 2010. His number 11 was retired in 2017, predating his 2019 election to the Hall of Fame and seemingly establishing the 58.6% of the vote he received that year as sufficiently "close" to election to satisfy the club's bylaws. Jersey number 11 was not issued to anyone else between Martínez's retirement as a player in 2004 until his return to the Mariners as hitting coach in 2015. Currently, only one other player has definitively met the requirements to have his number retired: Randy Johnson, who played 10 seasons with the Mariners (1989–1998) and was elected to the Hall of Fame in 2015. Despite not officially retiring number 19, the team has not reissued it since Jay Buhner left the team in 2001. Number 51, worn by Randy Johnson, was withheld from players from 1998 until 2001, when it was issued to Ichiro Suzuki upon his request after wearing it for his entire career in Japan. It was presumably taken out of circulation again, following Ichiro's 2012 trade to the Yankees coupled with Johnson's 2015 election into the Baseball Hall of Fame. The number was once again worn by Ichiro after he returned to the team in 2018. Number 14 (Lou Piniella) was not given to any uniformed personnel between Piniella's 2002 departure and 2015, but it was issued to third-base coach Manny Acta for the 2016 season. Jackie Robinson's number 42 was retired throughout Major League Baseball on April 15, 1997. Uniform number 00 is presumed off-limits, as it has been worn by the Mariner Moose since 1997 (outfielder Jeffrey Leonard was the last player to wear 00 for the M's, in 1990). From 1990 to 1996, the Moose wore the last 2 digits of the year of the current season. As part of the seventh inning stretch, after the crowd is led in singing "Take Me Out To The Ball Game" or "God Bless America" the public address system begins playing the Kingsmen's version of "Louie Louie". This commemorates a 1985 prank attempt to make "Louie Louie" the state song of Washington. As part of the mid-inning entertainment during games, three animated hydroplanes race on the T-Mobile Park Jumbotron screen. Each boat is "sponsored" by a local business. Fans are encouraged to cheer the boats on. The hydroplane races are inspired by actual hydroplane races held annually during Seafair, Seattle's primary summer event. Similarly, in a separate event, a baseball is hidden underneath one of three animated Mariners baseball caps and the fans are encouraged to shout out which cap they think the ball is under at the end of the caps' "dance." Both events are strictly for fun and no prizes are awarded. In 1994, the Mariners started a promotion called "Buhner Buzz Cut Night" Inspired by Jay Buhner's shaved head; any fan who was willing to have their head shaved before the game—or was already bald—would receive a free ticket to the game and a T-shirt with a slogan such as "Bald is Buhnerful" or "Take Me Out To The Bald Game". Hair 10 inches or longer was collected for charity. The promotion continued until Buhner's retirement in 2001, with a year's hiatus in 2000, and is still remembered by fans today. Boston Red Sox fans holding a sign requesting rally fries. Rally Fries are a baseball tradition started by Mariners broadcaster Mike Blowers in 2007. During a game against the Cincinnati Reds, a fan tried to catch a foul ball along the right-field line but in turn spilled his tray of french fries along the track. While chatting on the air and seeing the mishap, Blowers' partner, Dave Sims, suggested that he should send a new tray of fries to the fan. Blowers agreed, and sent his intern to deliver a plate of fries to the man. At the Mariners' next game, fans made signs and boards asking Blowers for fries as well. Coincidentally, every time the fries were delivered, the Mariners seem to score or rally from a deficit, and thus the "Rally Fries" were created. 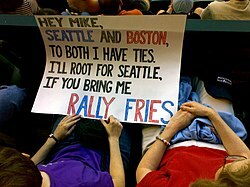 This became so popular with the fans that signs were even seen when the Mariners were the visiting team, although on August 1, 2009, Blowers established that he only gives out fries at home games. Generally, Blowers will select a person or a group of people that appeals to him, whether it is through fans wearing elaborate costumes or waving funny signs and boards. The fries are usually delivered from Ivar's, a Seattle-based seafood restaurant with a location at T-Mobile Park. The amount of fries given out varies with the size of the winning group of fans. The winners are generally selected around the 5th or 6th inning, although potential candidates are shown in almost every inning beforehand. As the 2011 season progressed, the Mariners marketing staff came up with an idea to encourage the growing fanbase of star pitcher "King" Félix Hernández. Every Hernandez start at T-Mobile Park is now accompanied by the King's Court, a designated cheering section for fans to sing, chant, and cheer while donning yellow T-shirts and K cards that are supplied by the team. The King's Court is both a personal rooting section for Hernandez and trend-setter for T-Mobile Park. The team encouraged fans to dress like Larry Bernandez, Hernandez's alter ego from a Mariners TV Commercial, or show up in wacky costumes, rewarding the best with a ceremonial turkey leg. The Supreme Court is a special occurrence when the King's Court is extended to the entirety of T-Mobile Park. The first Supreme Court was Félix's first home game following his perfect game in 2012. Since then it has occurred each year at Félix's first home game of each season. The ultimately disappointing 2017 season had a few bright spots, including the establishment of the Maple Grove, a variation of the King’s Court which honors James Paxton rather than Félix Hernández. At home games where Paxton starts, a group of fans sit by a Maple Grove banner, typically in the left field bleachers. A potted maple tree is also present in their section, provided by the Mariners; the Grove dubbed the tree "Stick Rizzs", in honor of long-time Mariners broadcaster Rick Rizzs. When Paxton got to two strikes on a batter, the Grove held up “Eh” Cards, a tip of the cap to Paxton’s home country of Canada and a nod to the "K" (for strikeout) cards held up in King's Court. Variant cards have also been produced for special occasions, such as when a planned Paxton start turned into a Hernández start (a King's Grove, with "K'eh" cards to cheer for Hernández). Other examples include when celebrating Paxton reaching 300 strikeouts, or in tribute to broadcaster Angie Mentink ("A" cards, to show support after she had publicly disclosed her being diagnosed with breast cancer). The Maple Grove differs from the King’s Court in that it was created and organized by fans, while the Court was promoted by the Mariners marketing team. When asked, Paxton stated that fans creating the Maple Grove was really special to him and that he never imagined that something of the sort would ever be done for him. The Grove continued until Paxton was traded to the Yankees following the 2018 season. The following elected members of the Baseball Hall of Fame spent part of their careers with the Mariners. Players and managers listed in bold are depicted on their Hall of Fame plaques wearing a Mariners cap insignia. † – Pat Gillick was elected as an Executive/Pioneer due in part to his contributions to baseball as general manager of the Mariners. ‡ – Randy Johnson is depicted on his Hall of Fame plaque wearing an Arizona Diamondbacks cap insignia; however, the Hall of Fame recognizes the Mariners as his primary team. Names in bold received the award based primarily on their work as broadcasters for the Mariners. 4, 16, 38 Mike Blowers  3B 1992–1995, 1997, 1999 Attended the University of Washington. The Mariners' flagship radio station is KIRO-AM (710 ESPN Radio), which previously broadcast Mariners contests from 1985 to 2002. Former flagship stations include KOMO-AM (2003–2008), and KVI-AM 570 (1977–1984). Television rights are held by Root Sports Northwest. During the 2016 season, the Mariners averaged a 5.84 rating and 103,000 viewers on primetime TV broadcasts. In years past, Mariners games have also appeared in Seattle on over-the-air stations KING-TV, KIRO-TV, KTZZ-TV (now KZJO), and KSTW. Selected Mariners games are also available on Canadian television, due to an agreement between Root Sports Northwest and Rogers Sportsnet Pacific. Since 2013, Rick Rizzs and Aaron Goldsmith have called games on the radio. The television broadcasts are anchored by play-by-play announcer Dave Sims and color commentator (and former Mariners player) Mike Blowers. Seattle radio personality Matt Pitman hosts the post-game show on the Mariners' radio network, along with clubhouse reporter Shannon Drayer. Spanish-language radio broadcast duties are handled by Alex Rivera on play-by-play and former second baseman Julio Cruz providing color commentary. The Mariners' broadcast team for 2010 featured Dave Niehaus and Rizzs—back for their 32nd and 23rd seasons with the club, respectively—as well as Sims and Blowers. For the first three innings of each game, Niehaus worked the television broadcast with Blowers while Rizzs and Sims handled radio duties; after the third inning, Niehaus and Sims traded places. Niehaus, who had broadcast for the Mariners since their inaugural season of 1977, died on November 10, 2010. For the 2011 season, Dave Niehaus' duties in the broadcast booth were filled by a collection of former Mariners broadcasters such as Ron Fairly, Ken Levine, and Ken Wilson; and former Mariners' players such as Dave Valle, Dan Wilson, Jay Buhner, and Dave Henderson. Tom Hutyler has been the Mariners' public address announcer since 1987, first at the Kingdome, and presently at T-Mobile Park. While KOMO 1000 AM was the Mariners' flagship radio station, Hutyler occasionally hosted the post-game radio show. Most Home Runs: 417, Ken Griffey Jr.
^ a b c Johns, Greg (January 23, 2015). "Mariners unveil new alternate uniforms". Mariners.com. MLB Advanced Media. Retrieved January 7, 2018. ^ a b "Seattle Mariners Logos and Colors Through The Years" (PDF). 2017 Seattle Mariners Information Guide. MLB Advanced Media. March 5, 2017. Retrieved February 27, 2018. ^ Johns, Greg (April 27, 2016). "Nintendo selling Mariners to minority owners". Seattle Mariners. Retrieved June 16, 2016. ^ Stone, Larry (April 27, 2016). "New Mariners CEO John Stanton is baseball-loving billionaire with World Series goal". The Seattle Times. Retrieved May 28, 2016. ^ martinstezano (August 26, 2015). "6 Things You May Not Know About the World Series". A&E Television Networks, LLC. History Channel. Retrieved August 26, 2015. ^ Kramer, Daniel (October 22, 2018). "These teams have never won the World Series". MLB.com. MLB Advanced Media. Retrieved October 25, 2018. The Mariners have not only never appeared in a World Series, but they are riding the longest playoff drought in any of the four major pro sports at 17 years. ^ Cour, Jim (1999-06-27). "Good riddance". The Austin American-Statesman. ^ "The Mariners chosen as name for new team". Eugene Register-Guard. Associated Press. August 25, 1976. p. 3C. ^ Brown, Patrick (August 7, 2007). "Griffeys made home run history in '90". Seattle Mariners. Retrieved August 7, 2007. ^ Raley, Dan (2003-07-12). "Piniella returns to Seattle's warm embrace". The Seattle Post-Intelligencer. Retrieved 2007-09-28. ^ Stone, Larry (October 22, 2008). "M's hire Brewers' Jack Zduriencik as GM". The Seattle Times. ^ Street, Jim (June 2, 2010). "Griffey Jr. announces his retirement". MLB Advanced Media. Retrieved April 29, 2017. ^ "Mariners replace Wakamatsu with Brown". Seattle Mariners. 2012-06-19. Retrieved 2012-10-15. ^ John Hickey %BloggerTitle% (2010-10-18). "Mariners Announce Hiring of Eric Wedge; Move Praised by Wood, Lee, Others". Mlb.fanhouse.com. Retrieved 2012-10-15. ^ Stone, Larry (2012-10-27). "Mariners broadcaster Dave Niehaus dies". The Seattle Times. ^ Liebeskind, Josh (2012-04-21). "MLB.com Gameday | whitesox.com: Gameday". Major League Baseball. Retrieved 2012-10-15. ^ Greenberg, Chris (August 15, 2012). "Félix Hernández Perfect Game: Mariners Ace Records 27 Straight Outs In 1-0 Win Over Rays (VIDEO)". The Huffington Post. Retrieved October 27, 2012. ^ Johns, Greg (September 28, 2015). "Dipoto hired by Mariners to be general manager". MLB Advanced Media. Retrieved April 29, 2017. ^ Associated Press (October 9, 2015). "Seattle Mariners fire manager Lloyd McClendon after two seasons". ESPN. Retrieved October 9, 2015. ^ Johns, Greg (October 26, 2015). "Mariners name Servais manager". MLB Advanced Media. Retrieved April 29, 2017. ^ Divish, Ryan (27 April 2016). "Mariners to be sold by Nintendo to ownership group led by John Stanton". The Seattle Times. Retrieved 5 May 2016. ^ Novak, Paul (January 23, 2015). "Seattle Mariners Unveil New Uniforms". emeraldcityswagger.com. Open Publishing. Retrieved February 11, 2018. ^ a b Lewis, Adam (23 January 2015). "Mariners Unveil New Alternate Home Uniforms". Sports Press NW. Retrieved 31 January 2015. ^ Divish, Ryan (20 October 2010). "Mariners going green...with their jerseys". The News Tribune. Retrieved 31 January 2015. ^ Divish, Ryan (January 23, 2015). "Mariners debut new alternate uniform for Sunday home games". The Seattle Times. Retrieved January 31, 2015. ^ Munshi, Sonu (2012-03-05). "Peoria renews spring training lease with Mariners, Padres". The Arizona Republic. Retrieved 2012-10-27. ^ "Mariners Set Club Spring Home Run Record in Route of Reds". SWX Right Now. 2013-03-25. Retrieved 2013-03-25. ^ Booth, Tim (29 September 2014). "Wedge Says Goodbye As Seattle Falls 9-0 to A's". AP.Org. ^ "Seattle Mariners fire manager Lloyd McClendon after two seasons". ESPN. Associated Press. October 9, 2015. Retrieved October 9, 2015. ^ Gleeman, Aaron. "Scott Servias is the strong frontrunner to be mariners new manager". hardballtalk.nbcsports.com. NBC Sports. Retrieved October 23, 2015. ^ See: Baseball Museum of the Pacific Northwest[permanent dead link]. Seattle Mariners official website. Retrieved 2017-03-11. ^ Eaton, Nick (January 17, 2012). "Randy Johnson, Dan Wilson headed to Mariners Hall of Fame". Seattle Post-Intelligencer. Retrieved January 18, 2012. ^ "Mariners Hall of Fame Guidelines". Major League Baseball. Retrieved June 27, 2017. ^ Johns, Greg (January 8, 2016). "Mariners to retire Griffey's No. 24". MLB Advanced Media. Retrieved April 29, 2017. ^ Axisa, Mike (August 7, 2016). "Mariners retire Junior's number, and a statue for Griffey is also on the way". CBS Sports. Retrieved April 29, 2017. ^ Johns, Greg (January 24, 2017). "Mariners to retire Edgar Martínez's No. 11". MLB Advanced Media. Retrieved April 29, 2017. ^ Katie G. Cotterill; Sean Quinton (January 24, 2017). "Here's a look back at Edgar Martínez's legendary Mariners career". The Seattle Times. Retrieved April 29, 2017. ^ Hansen, Patrick (2011-05-15). "Seattle Mariners: 5 Best Safeco Field Traditions". Bleacher Report. Retrieved 2012-10-27. ^ Moore, Jim (August 13, 2007). "Go 2 Guy: Fry, fry away -- rally fries take off". Seattle Post-Intelligencer. ^ Floyd, Brian (2011-06-29). "Félix Hernández Ignites King's Court; Mariners, Marlins Play Calvinball". SB Nation. Retrieved 2012-10-15. ^ Divish, Ryan (November 19, 2018). "Mariners trade left-hander James Paxton to the Yankees for three prospects". The Seattle Times. Retrieved January 31, 2019. ^ Carr, Samantha (6 December 2010). "Emotional Election". National Baseball Hall of Fame and Museum. Retrieved 5 January 2011. ^ "Johnson, Randy". Baseball Hall of Fame – Hall of Famers. Retrieved 2016-07-27. ^ Stone, Larry (January 17, 2013). "Mariners add Aaron Goldsmith to broadcast team". Seattle Times. Retrieved 29 January 2014. Wikimedia Commons has media related to Seattle Mariners.